It's been a busy couple of days for me! 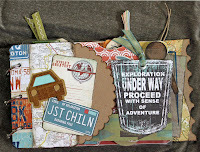 I have finished one of my travel-themed albums & now I am hard at work on the 2nd one! In between all this wonderful time I've had working on these albums, I have been uploading new photos to The Scrap-a-Teeny Girls' flickr album! Most of the work we haven't sold will hopefully be up over the next couple of days as well! We are in the process of trying to figure out if the online venues (Etsy & eBay) are worth our time & money to sell these creations of ours. So, over the next week, we three will check out some of the local shops that showcase local artists. I'll let everyone know soon! Over the weekend, I got together with my BFF Rachel & went to the Fancy Tiger's 3 yr anniversary party. It was great fun & very inspiring! Afterwards, we visited the local Goodwill for some great treasures! I am just itching to paint & sew some great new purses! Oh, why can't I be a better multi-tasker like my mom!! She's always got at least 3 projects in the works! Nick got roped into going rafting with his older brother & family who are up at the cabin for the week. So I took advantage of him being gone & dropped Maggie with Auntie Kim for the day/night & tried to get some work done! Didn't accomplish too much, but it was nice to have some uninterrupted time to do nothing in! Then Kim was kind enough to bring Maggie back to me on Sunday & stay for an afternoon of scrapping. Neither of us accomplished much that day either! We did watch some Bond together as well as "My Big Fat Greek Wedding." Scrapping in front of the tv is fun, but doesn't help the juices flow! My wonderful Laughing Magpie is still as busy as ever & I have decided to change her 1/2 days at school 2 days a week to 2 full days so that I might regain some of my sanity & not feel like such a life-slacker!! Plus, she wakes up everyday & asks me if it's a school day! She just loves it! Nick is crazy-busy with his new office build-out & will hopefully settle down by the end of August when they are hoping to be officially moved in! Until then, he has little time for anything leisurely! We keep talking of a road trip or camping, but he just can't leave for even a long weekend until everything is under control! I am hoping to plan something as a surprise for when things settle down - probably an impromptu camping trip nearby. Right now, everyone is in bed but me & I am listening to the rain cascade down the windows of my studio. It's such a peaceful way to end a busy day! Sisters, Scrappin', Wine & Scary Movies! This has been a pretty good week for me! It's also fabulous for me, since I get to have lots of girl time (gossiping, griping & sharing those girly moments! ), & scrap most of the day with my sister, who is first & foremost, my BFF! Sure, I have another BFF & lots of great gal-pals, but Kim always comes first (sorry BFF #2!). It wasn't always like that - we fought like cats & dogs when we were younger. Funny how time changes things! Now, we hardly go a day without talking! It wasn't all smooth sailing this week though - We had to deal with a very active 3 yr-old, a "bored" tweener, & a couple of crazy-barking dogs. And to top it all off, plumbing issues for the better part of a day! But amidst the chaos, we scrapped, played Bananagrams with cocktails in the evening (SOOO much fun!) & we watched 2 very stupid "scary" movies - we should have skipped the IFC ones & just watched the re-makes of Friday the 13th & My Bloody Valentine! Then we wouldn't have felt so cheated after-wards! (Don't bother with "Dark Mirror" or "Surveillance "!) Since our boys never like to watch the scary ones, so we like to get together for the terrifying ones! So far, nothing beats The Strangers ('08) for scaring the crap out of us!!! We also brainstormed with our pal Rachel about possibly finding a local venue to either display/sell or buy outright our work to get some more exposure. The Etsy thing isn't going so great. We will talk to mom when she returns from a week in Ohio with friends to see whether we want to give eBay another shot or try the local venues. Either way, we had a great couple of days working on our projects together & swapping ideas. Needless to say, there's nothing like a sister! I love you Kim!!! PS - check out my Flickr Gallery by the end of the weekend! I should have some new work up by then - I have finally finished putting together my albums from our Italy trip from 2 years ago!! Just a quick little note to let everyone know that we, The Scrap-a-Teeny Girls, have just marked down our Teeny Albums on Etsy by 15%! Pass it on! Hope everyone has a happy & safe 4th of July!